You have several green smoothie recipes, but you now need the right blender. Choosing the best blender for green smoothies has more to do with an individual unit’s design features and component specifications than its price tag. It is true that a higher cost, as is seen with many other home and kitchen appliances, can be indicative of superior functionality, but the most important thing for you, the consumer, is to understand the individual design elements that make any blender specifically good—or bad—for green smoothies. Green smoothies are delicious, nutritious, and satisfying. You don’t have to be a health nut to appreciate the fresh, explosive flavors that are set loose from the regenerative ingredients contained in green smoothies. Compared with juicing, smoothies offer more nutrient value, less clean up and a faster process all around. However, all blenders are not created equal when it comes to the unit’s food processing abilities. That being said, do not despair. Just because you don’t have a $1000 or more to drop on one of the best high-speed blenders on the market, it doesn’t mean that you have to give up on your green smoothie goals. Perhaps you have only heard of green smoothies or maybe you are an avid fan. For those who have tried one, there is an undeniable fact: Green smoothies are delicious. But, the reason that people all over the globe have taken to making green smoothies a part of their everyday life, is that, along with tasting really good, they are incredibly healthy. From the kitchen to the grocery store to the gym, there is a green smoothie wave that is sweeping over the country. A dense serving of nutrient-rich raw foods is the best way to set yourself up for success and there is no secret to why green smoothies make people feel like a superhero. It starts off with a base of dark, fibrous leafy greens, such as romaine lettuce, kale, collard greens, Swiss chard or dandelions. Often, it will use almond milk or coconut milk as a liquid medium, as well as fresh fruit, like mangos, pineapples, bananas, or strawberries. Some people even throw an avocado in the mix for some essential, all-natural fats. To top it off, protein is often added in the shape of peanut butter, chia seeds, or protein powder and finally it is sweetened with natural sugar, like honey, agave, or stevia. Green smoothies have a tendency to break blenders that are not meant for processing fiber rich biomass or of poor quality design and craftsmanship. Many of the affordable high-speed blenders that are found online or in stores might work perfectly for almost every other culinary need, but they are not designed to handle the power requirements or motor stress from chopping highly fibrous vegetables on a regular basis. The biggest problem in making home-made green smoothies a part of your daily routine is in finding a good blender that is up for the task. Like any tool, good blenders are designed for a specific task. The task may be singular or multi-faceted. As it relates to blenders, there are many uses for which any individual product may be designed or many uses for which a unit is unequipped to handle. Determining the features that are essential for you will ensure that you get the right tool for the job. Blenders are designed with one of three blade types. For dry goods, grains, nuts, and beans, there is a dry blade. A dry blade is angled so as to push the contents to the bottom of the blender’s container. This ensures that the contents being processed will not escape in a big cloud of dust when the container is opened. Wet blades are much more common than dry blades and are designed to throw the contents around the walls of the blender’s container, ensuring an evenly processed mix. A hybrid of both dry and wet blades is seen in most budget blenders. These combo blades have a dry blade set below a wet blade to maximize the unit’s versatility. Luckily, all blenders, for the most part, feature detachable blades, which make the cleaning process easy. Making a big batch of kale, spinach, and strawberry smoothies for five people is very different than making a batch for fifty people. Likewise, your blender requirements will be different if you practice a regular routine of making smoothies, as opposed to using it for the infrequent milkshake or puree. The more frequently used a unit is the faster it will encounter technical difficulties and require maintenance. A blender that will work well and reliably for an individual’s use may not be adequate for commercial use due to power output, serving size capacity, or noise decibel level. Of course, there is a blender for every kind of use, but there is no need to get an industrially commercial unit, which will run over $700 if all you need is a home kitchen blender. Similarly, it is not advisable for commercial caterers to save a buck or two with a high-functioning consumer blender, when they will end up wearing out the unit within just a few months. Seeing as all blenders are not made equal and each unit is designed for specific usage parameters, your blender choice will depend on the unit’s usage features, volume capacity, and your budget. There are four general types of smoothie blenders, offering individual benefits and limitations. Among these types of blender, are high-performance, conventional, personal and immersion blenders. High-performance units are the blender equivalent of a Rolls Royce. They are the best, and most people do not need, nor can afford, a Rolls Royce—and that is just fine. There are plenty more affordable options on the market that will be suitable. However, for commercial use, as well as for those who demand the highest quality blending abilities, high-performance blenders are the best choice. Making green smoothies are a breeze in the vast majority of these blenders. High performance means that they will likely feature over 2-horsepower, peak-performance motors, which will make sawdust of logs—let alone hearty, leafy green smoothies. Many of these units offer sound dampening shells and are perfect for everything from juices to green smoothies to hot soup. The best brand on the market for green smoothie blenders is, arguably, Vitamix. Vitamix blenders usually range in price from around $400 to nearly $1000. They are unmatched in quality, consistency, and usage longevity—not to mention much quieter than most of the competition’s high-performance blenders. The majority of home kitchens in the world have a conventional blender. Though, some of the most recognizable brands do have a select number of products that dip into the high-performance category; these are the blenders that are most commonly attributed to private, home use. The price range for these units is as vast as the capabilities they feature. The best conventional blender for green smoothies can cost anywhere from less than $100 to around $500 or $600. Most of these blenders are not suitable for hot soups or hearty smoothies. However, there are the outliers in the higher quality bracket of conventional blenders. Often, they will feature a plastic top container, limited settings, and a low- to medium-power output. Choosing a blender that is powerful and versatile enough for a wide range of uses, often means investing in a product that carries a higher sale price. Choosing a unit that sits around the $100 range, will not likely have the functionality to slice and dice raw fruits and vegetables efficiently for a silky smooth green smoothie. Among the best—and most recognizable—brands featured in this blender type category, are Hamilton Beach, Blendtec, and Ninja. Blendtec is on the upper end of conventional blenders and deserves its due respect as an industry leader. Their units will often range between $300 and $500. Hamilton Beach is one of the most popular mid-level smoothie blenders and is sold in the $200 to $400 range. Ninja—the infomercial wonder-kid—Is popular because of its unique blade structure and affordable price. Usually, Ninja blenders perform admirably for moderate use in the home kitchen. Personal blenders are not the type of machine that can handle green smoothies. They usually feature a small jar that doubles as the blending container and a low-power motor. These are designed for moderate usage, but not for raw vegetables. Their poor little motors will bet all tuckered out in no time. But, they are decent for protein shakes and light sauces. Immersion blenders are handheld, low-intensity units, with a low-power motor. They are very useful for beating eggs and whipping up some homemade whipped cream. They can even work sufficiently for milkshakes, made directly in the glass; however, they cannot handle any fiber-rich vegetation. All you will end up with is a mess and a waste of a perfectly good immersion blender. That being said, you could use it to make your pre-blended green smoothie that much frothier, but you’d better hope that all the chunks are gone. There are several key elements to be aware of in choosing the best blender for green smoothies. A blender that is specifically catered for making high fiber, nutrient-dense green smoothies must feature a high-powered motor. The power output will bring the unit’s blades up to a high speed, which is necessary for the finished smoothie to have a silky consistency. Along with a high-powered motor that spins the blades at an ultra-high speed, comes the ability to make more volume in one go. Personal blenders can chop ice and frozen fruits adequately because their capacity requirements are small. Less substance means less resistance on the blades and motor. For green smoothie lovers, a blender will also need to function reliably and consistently when being put through daily use. Therefore, the key features to look for in a blender designed for green smoothie making are a powerful motor, durable construction, versatility in speed setting options, and the pitcher’s liquid volume capacity. For a green smoothie blender, the minimum power output suggested in terms of the unit’s motor is at least 1000 watts. Conventional blenders will range in wattage, from around 300 to upwards of 1200 or more. However, more wattage does not necessarily result in a better blend. The torque of a blender’s motor also plays a key role in the quality and reliability of a heavily used unit. Immersion blenders are the exception as they are dealing with fewer pounds per square inch of resistance, which creates a consistent blend without a large amount of torque. Most tabletop blenders on the market, whether conventional or high-performance units, feature at least three speed settings. Low-end blenders that feature more than five or six speed setting are probably too big for their britches as it is unlikely that the unit’s motor will have enough adequate power variance to create a noticeable difference in the resulting blend. High-end blenders often will feature around ten speed settings. Some blenders will have pre-set speeds for specific items, such as smoothies, ice cream, juices, and hot soup. 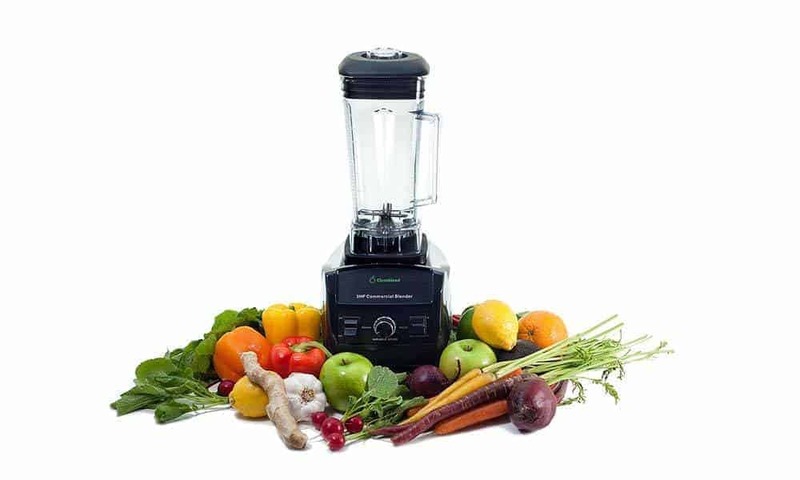 When it comes to raw vegetable blending, speed variation can be the difference between a blender that lasts a lifetime and an expensive paperweight. Choosing a blender might seem like a small decision; however, an informed decision—however small—over time becomes a worthwhile investment. Your kitchen deserves the best appliances that you are able to attain because blending is a craft and craftspeople need high-quality tools. If you want to make delicious, creamy-smooth blends regularly, there is no use in getting the wrong tool for the job. Even a middle-grade product will, over time, require maintenance and replacement if consistently put through heavy use. Don’t sacrifice your green smoothies because you don’t have the right tool. Choosing the best green smoothie blender becomes a decision to make a long-term investment in a healthy lifestyle habit and a high-quality unit will serve you smoothie delicacies every day for years to come. Overall, the best blenders for smoothies are from Vitamix. They manufacture high-performance blenders for both home and commercial use and are unmatched in product quality. Blendtec is another high-performance brand, which offers similarly high-functioning blenders as those of Vitamix. At the end of the day, whether you go with Vitamix or Blendtec, you are getting a top of the line machine and your kitchen will thank you. Breville, Hamilton Beach, and Kitchenaid are all high-end conventional blender brands, which offer a range of quality products for moderate use. Ninja, which is a suitable blender for occasional, low-intensity green smoothies, offers the benefit of savings, but not longevity. Below, are our choices of the best blenders for green smoothies—from best to budget models. Choosing the best blender for green smoothies will enable your daily ritual to thrive without mechanical complications and added expenses. Vitamix offers the best quality and highest performance standards while Blendtec, Breville, and Hamilton Beach offer a more affordable alternative without sacrificing functionality. Ninja offers no guarantee of long-term consistency or reliable functionality, except from users’ positive feedback. So, if you must use your Ninja to make green smoothies, cut everything into small pieces first. Our advice: Skip the hassle and choose a blender that will become a rewarding investment in the future of your good health. Feel free to leave comments and questions and remember to practice good safety habits when blending delicious smoothies.